Enjoy a comfort food classic with Chili con Carne with Rice. 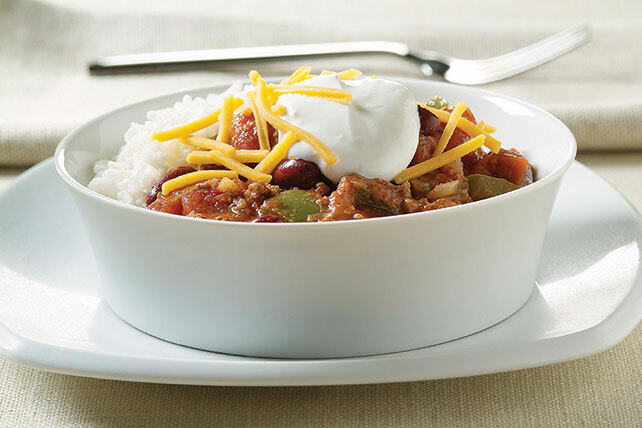 Chili con Carne with Rice is all the flavor you loved served with toppings on a bed of rice. Heat oil in 6-qt. saucepot on medium-high heat. Add onions, green peppers and garlic; cook and stir 5 min. or until vegetables are crisp-tender. Add meat; cook and stir 5 min. Add tomatoes, beans, broth, tomato paste and seasonings; stir. Bring to boil; simmer, partially covered, on low heat 1 hour or until thickened, stirring occasionally. Serve over rice. Top with cheese and sour cream. Prepare using KRAFT 2% Milk Shredded Cheddar Cheese and BREAKSTONE'S Reduced Fat or KNUDSEN Light Sour Cream. Use a small knife to cut up tomatoes right in the can. This chili freezes well. Prepare as directed; cool completely. Ladle into 1-qt. freezer containers and freeze up to 3 months. Thaw in refrigerator before heating to serve. Makes 9 servings, 1-2/3 cups each.